Michael Bairefoot creates his own unique and personal style of world class magic. His exclusive presentation of the classics “with a twist” will astound and amaze his audience as the magic happens right before their eyes and can make any event a truly magical and memorable experience. His incredible shows will make your audience the star of the night. Just for 1st place awards alone Michael has gathered 30+ and is currently the most award winning magician in America. He also is the “Magic Idol” for all magicians, a title awarded to him by the prestigious International Brotherhood of Magicians’ at one of their national magic conventions, which got him booked at the world renowned Magic Castle in Hollywood, CA. 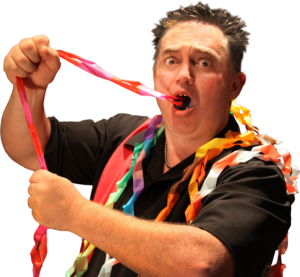 The Michael Bairefoot magic show at the GTS Theatre was a light hearted and pleasant addition to our vacation. All ages enjoyed the funny jokes and interacting with Michael as he gave an entertaining show using illusion and his gift of humor. The GTS Theatre is a small yet inviting show venue that adds a diversity to the Myrtle Beach show scene that’s a welcome addition to the area’s entertainment.